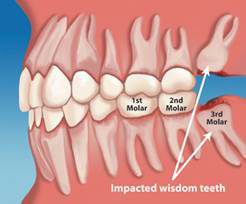 Wisdom teeth are the last molars on each side of the jaws. They are the last teeth to come through. Most people have four wisdom teeth, one in each corner. They usually appear between the age of 14 and 30 although in some they may never erupt. However, sometimes they appear many years later. Nowadays people often have jaws that are too small for all 32 teeth – 28 is often the most we have room for. So if all the other teeth are present and healthy there may not be enough space for the wisdom teeth to come through properly. Why Are Wisdom Teeth Temoved? Your jaw may not be large enough for them, and they may become impacted and unable to erupt correctly through your gums. If your wisdom teeth cannot erupt properly they can impinge on the adjacent teeth and make it more difficult to clean these teeth. This can sometimes result in interdental decay. One or more of your wisdom teeth may erupt at an awkward angle, with the top of tooth facing forward, backward, or to either side. This will again make cleaning more difficult and if bacteria/food gets trapped in the gums it can lead to pericoronitis, a localised infection in the tissues surrounding the wisdom teeth. The National Institute of Clinical Excellence (NICE) has issued guidance on when wisdom teeth should be removed, please see here. Before removing a wisdom tooth, your dentist will give you a local anaesthetic to numb the area where the tooth will be removed. Sedation can sometimes be used, especially if the patient is nervous or it is anticipated to be a difficult extraction. Swelling (inflammation) of your mouth and cheeks – this will be worse for the first few days after the wisdom teeth removal but will gradually improve; gently pressing a cold cloth to your face and the use of anti-inflammatory medication (as recommended by your dentist) will help reduce the swelling. Pain from teeth extractions, which varies according to the difficulty of the extraction. Sutures; we may close the socket with sutures, which will remain in the mouth until they dissolve (if resorbable) or are removed by the dentist (if silk sutures). For the lower wisdom tooth, there is a risk (0-10% of cases) of damaging the inferior alveolar nerve (although this depends on how closely it relates to the roots of the teeth, which can be estimated with good quality radiographs). This can result in temporary, or in rare cases, permanent tingling and/or numbness to the lower lip, chin and tongue. For the upper wisdom teeth, there is a small risk of opening an oro-antral communication into the maxillary sinus. This again depends on how closely the roots of the teeth relate to the sinus floor. If it is small it tends to heal up spontaneously, although sometimes it must be closed with sutures. There is also a very small risk of dislodging the tooth into the sinus, from where it must then be retrieved. Relieve the pain using pain killers such as Paracetamol or Ibuprofen. Avoid rinsing, spitting and drinking hot drinks or anything hard. Eat soft or liquid food for a few days and try to avoid chewing directly onto the area to avoid discomfort (chew with your other teeth). For a simple tooth extraction fees start from £150, ranging to £300 depending on the difficulty, amount of time and expertise required for the tooth removal.